Visions of Jesus Christ.com - Defying the odds: Woman struck by lightning walking, talking. Defying the odds: Woman struck by lightning walking, talking. In article mentions that she she had an out-of-body experience during the minutes after she was struck by lightning in July. Also remembers being with deceased Aunt that was holding her while she was in a coma, rubbing her head and telling here she is going to be OK.
Pictured above Brittney Preh lightning survivor. September 13, 2018 - Reported [here]. Also [here]. Defying the odds: Woman struck by lightning at Country Thunder walking, talking. 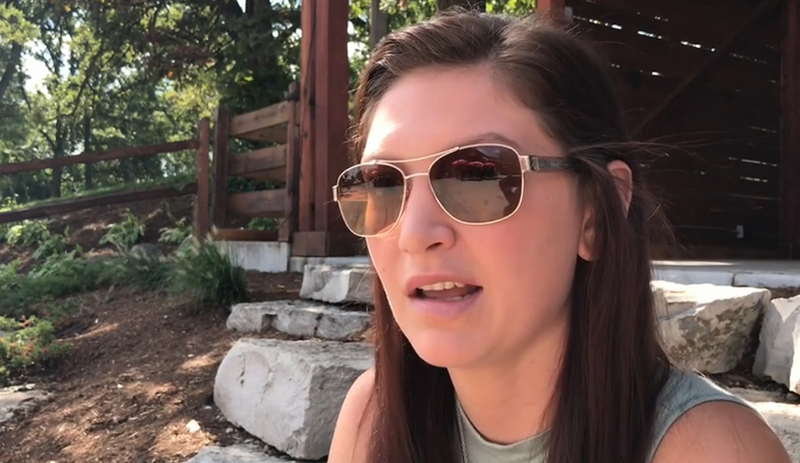 Brittney Prehn is not taking life for granted after getting struck by lightning in July at Country Thunder. "I’m definitely going back next year. I’m not going to let something stop me from something I've been doing for how many years," Prehn said. Prehn said she does not remember getting struck by lightning, but she does remember talking on her phone before it happened. WISN 12 News obtained [video] of the lightning strike that hit the ground, went through Prehn's body, then out through her phone. "When [the lightning] hit, it hit where I was talking and the phone took part of the bolt," Prehn said. "If I wouldn’t have been on my phone, I would have had all of it come through me and hit me and that could have exploded my head, it could have completely ended me." Prehn told WISN 12 News when she woke up in the hospital, the first person she asked for was her aunt who died two years ago. "I was asking for my aunt, and it felt so real. She was holding me while I was in a coma and rubbing my head and told me I'm going to be OK," Prehn said. "She told me it was 'time to go home to your family' and I said, 'No, I don’t want to go home.' I remember I didn't want to leave her, and she told me it’s time to go home, and I woke up to my dad and my mom." Two weeks later, Prehn had another memory. This one was an out-of-body experience during the minutes after she was struck by lightning. "I just kept hearing, 'Stay with me, stay with me,' and all of a sudden, I zoned out and I can see myself laying in the back of a gator in my clothes and I watched them shine lights in my eyes and cut my top off," Prehn said. She said her mom confirmed with doctors her memory was correct. Prehn has plenty of obstacles she will need to work through. She has scars all over her body, cannot control part of her face, is mostly deaf and is learning how to walk again. She goes to physical and speech therapy four times a week and needs to rely on her family, but she isn't letting that get her down. "I’m pushing because I want my sisters to see no matter what life throws at you, what happens, you can do it. You can get through it," Prehn said. "Seeing people walk around so miserable and hating life and upset and miserable makes me so upset. You should be happy with what you have because one day, you could get hit by lightning." A fundraiser for Prehn with raffles and live music is being held Sept. 15 at Niko's Red Mill Tavern in Woodstock, Illinois. The fundraiser goes from 1 p.m. to 6 p.m., and all of the funds generated will go toward Prehn's medical expenses. Brittney Prehn -Struck by Lightning GoFundMe [here].